Oh yes I said it. BEER brownies! If I can convince you to make one dessert for (yourself on?) Valentine’s Day, this shall be it! These are so rich and decadent and guess what? They only make a tiny serving! Just for you! And me. Of course. 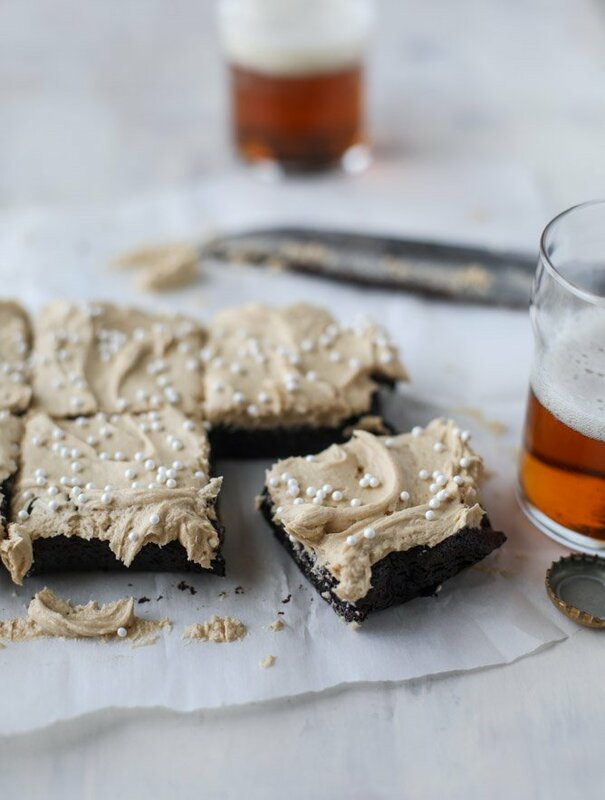 These beer brownies come from Christina’s newest book Sweet & Simple: Desserts For Two which is out now, just in time for your sweet teeth to crave some super chocolately deliciousness. Christina makes all the best desserts in batches to serve two people. Two! Isn’t that amazing? I’ve probably mentioned it a million times but really, the only person I know who can bake a 9×13 pan of brownies and not consume it like a pyscho is my mom. She can make a large serving of ANY dessert, have it sit in eyesight on her counter in the kitchen and enjoy one single serving every single day and no more. Absolutely NO more. Not even a crumb. I fall somewhere in the middle of that and omggivemeallthesugar. Since I technically cook for my job and have a lot of food in my house at once, I have a certain level of discipline when it comes to dessert. Bake a pan of brownies. Cut myself one pretty square of fudgy brownie after lunch. Eat it. Enjoy it. Not like “enjoy it” by sitting down and savoring every bite, but more like “enjoy it” while standing over the sink and simultaneously scrolling through Instagram on my phone. I’ll take one more forkful. I mean, I don’t need a whole piece. I’m pretty satisfied and a whole second brownie will send me over the sugar edge. But a forkful? Yeah. I can do that. I mean, maybe a second forkful. And a crumb. I dropped another crumb. Need another crumb. It’s cool, these bites don’t have calories. Work work work work work (sung like Rhianna, I’m embarrassing) and then an hour later just maybe onnnnne more forkful. Seven hours later dinner is over and there are 13 forkfuls of brownie taken directly out of the pan. BUT I NEVER ATE A WHOLE BROWNIE! Do you relate? Or would you and my mom be besties? That’s why I have always been obsessed with Christina’s concept of desserts for two. Two! Probably also since until fairly recently I was only part of a family of two, and those desserts were perfect for Sunday night dinner and the link. Small batch sugar cookies? Yes please! Little cheesecakes? Hello lover. So. Guess how we start out making these beer brownies? By making a beer syrup. BEER SYRUP. I need to tell you again. Beer freaking syrup! Christina calls it a beer concentrate and it happens by boiling beer down until it’s, well… concentrated. Yes yes. I sort of just wanted to slurp it off of a spoon. The beer syrup gets mixed into the brownie batter. It gives the best hint of flavor EVER. A tiny bit also gets whipped into the buttercream and now isn’t that just the best thing you’ve ever heard of in your little life? Sugar plus butter plus BEER. Oh hi I’m eating this for dinner. Heat the beer in a small saucepan over medium heat and let it simmer until it reduces to 1/2 cup. This will take 15 to 20 minutes and be sure to watch it so it doesn’t boil over. If it starts to bubble up, stir and remove it from the heat to let it come down. Preheat the oven to 325 degrees F. Line a 9×5 inch loaf pan with parchment paper. In a microwave-safe bowl, combine the butter, cocoa, sugar and chocolate. Microwave for 30 seconds, stir, then microwave for another 30 seconds. Stir until everything is melted and combined. Let it cool for a few minutes. Stir in 4 tablespoons of the beer syrup, the egg white, vanilla and salt. Stir in the flour until fully combined. Pour the mixture into the lined loaf pan and bake for 4o to 45 minutes. The brownies are done with the top is dry and a toothpick inserted has only a few crumbs sticking. Cool the brownies completely. Once cool, frost and top with sprinkles if desired. Slice and serve. Beat the butter and sugar with an electric mixer until combined and fluffy. Beat in the remaining tablespoon of beer syrup until combined. Frost the brownies once cool. These are the fudgiest things in life. Beer syrup! OH MY! These look fabulous. I love the idea of desserts for two. Sometimes I’m good about freezing part of a recipe, so I’m not so tempted to overconsume. Otherwise, if I’m sensible and don’t overeat, most desserts get a little dry and stale before we can consume them. So so sweet! Cant wait to get this cookbook! Lol me and your mom could definitely be friends, I’ve been known to let a pan of brownies go STALE on the counter because I’m only eating one per day (or less!) – I know, and I’m sorry for my behavior. Is it bad that my first thought was “huh, I wonder if I could double these.” Yes, it will only be my husband and I eating them on Valentine’s Day. But I’m pregnant!! Doesn’t that count for at least an extra 3 servings?! that frosting tho!! get me a spoon and I’ll be good. Yum! I love how rich beer can make chocolate taste! OMG!! Stop it! Beer and chocolate are two of my very favourite things! 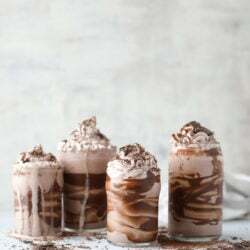 I need to make these right now and try to share them with my husband, he may not get any though..
Omg, I love this! I’ve been using your vanilla cupcakes for two a while now since I really love to bake but making a whole dozen plus cupcakes is not always convenient and really puts a dent in diet plans! I’ll check out Christina’s site, thanks for sharing, these look delicious!! OH AMAZING! I have no words for these beauties. My mouth is watering. I have her cookbook and am going on vacation next week and will be reading it page by page, like I read cookbooks from friends :) I can’t wait to make these! That frosting. omg. Hey girl- these look so yummy! I’m in your boat, I just love sweets! Beer syrup? What a cool idea and I love the color of the icing. Remember calories don’t count when you are standing over the sink eating them. ? Can I use Guinness or is that too dark?? Us single gals are gunning for St Patty’s not Valentines lol. We used Pelican Tsunami Export Stout. Seasonal for Jan/Feb here in Portland. Also think Deschuttes Black Butte Porter would be a good candidate. wonderful brownies!!! and that frosting!! to die for! These look amazing, and I’m so looking forward to baking them! I keep pausing at the time and wondering if 40-45 minutes is a little long for brownies — is that correct? 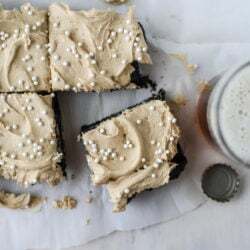 I’m just used to seeing/timing for more like 20-25 minutes for brownies, but maybe it’s an effect of the beer syrup, needing to cook them longer? Eating while standing over the sink scrolling through Instagram. You had me rolling with that one! Thanks for convincing me that I need these in my life. I wonder if a Guinness would be a good dark beer to use, or if I should go with a coffee stout or something like that…I guess I’ll just have to do both! The brownies in the photo look like they were baked in a normal pan, not a loaf pan; loaf slices look different. How were the ones in the photo prepared? nope, they were still baked in a loaf pan! you don’t slice the brownies into loaf slices – you bake it in the loaf pan since it’s smaller and then still cup them into squares! Hi-long time reader, first time commenter :) Made these and they were DELISH. I didnt really taste the beer, just a mind yeasty aroma. I used Guinness-will try again with a lager. The brownie itself was fudge-y heaven! Thanks for this and all your posts!